Luther Vandross, Nat Adderley, Jr.
(2002) "Dance with My Father"
"Dance with My Father" is the title track to singer and songwriter Luther Vandross' thirteenth studio album. With Richard Marx, Vandross wrote the song based on his personal experience. Its heart touching lyrics recall childhood memories with Vandross' father, who used to dance with him and his mother. 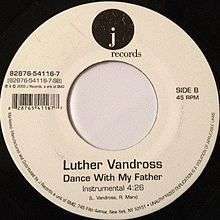 Despite the lack of promotion due in part to Vandross' hospitalization, "Dance with My Father" became one of the most requested songs at the time. During the 2003 Grammy Awards, "Dance with My Father" earned Vandross the Song of the Year and Best Male R&B Vocal Performance accolades. 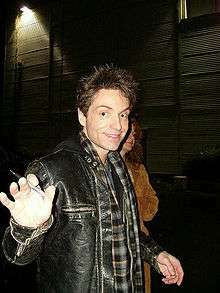 Illinois native Richard Marx co-wrote "Dance with My Father" with Vandross. Vandross wrote "Dance with My Father" with Marx, based on his personal experience. Considered by Vandross as his "career song", "Dance with my Father" is a tribute to his father, Luther Vandross, Sr., who died due to complications of diabetes. Vandross was seven when his father died. According to Marx, writing the song was emotional for Vandross because it is "a subject matter [Vandross] hadn't written before". On the backdrop of strings and interplay of piano and drums, Vandross recalls fond memories with his late father who used to dance with his mother. Mary Ida, his mother, says, "I was amazed at how well Luther remembered his father, how we used to dance and sing in the house. I was so surprised that at 7 1/2 years of age, he could remember what a happy household we had." Barry Walters of Rolling Stone magazine qualifies the memories invoked in the lyrics as painful and private, adding that when Vandross asks God to return his father, it "turn a potentially maudlin song into a meditative, deeply personal prayer". At the time of "Dance with My Father"'s release as a single on May 30, 2003, Vandross had been hospitalized due to his suffering from stroke. This timely release of the song gained attention from critics. On his review for the album, David Jeffries of AllMusic wrote that its release "makes the song's references to absent loved ones even more poignant". For Larry Flick of The Advocate, it transformed the song into "a haunting composition rife with subtext". Although Vandross was unable to promote the latest project, "Dance with My Father" was able to reach number one on music stations. For instance, it achieved top position in WLTW, which was one of the first stations in the United States to play the track. Before his stroke, Vandross wrote to WLTW's program director, informing him of what he considered to be his "career song". The director asked permission from the label, but it was not until after the hospitalization that J Records permitted the airplay, following the song being featured in Boston Public on April 28, 2003. "Dance with My Father" became one of the most requested songs at the time, spawning "a number of weepy phone calls and requests". In February 2004, "Dance with My Father" earned Vandross and Marx a Grammy Award for Song of the Year and Vandross a Grammy Award for Best Male R&B Vocal Performance. Marx accepted the award in behalf of Vandross, who was unable to attend due to health concerns. At the same event, singer Celine Dion performed a live rendition of the song in lieu of Vandross, and Marx accompanied her on the piano. After the performance, Vandross however accepted the awards on a videotaped speech. "Dance With My Father" was the last top 40 hit for Luther Vandross in the United States, peaking at number 38. The song also peaked at 21 in the UK Singles Chart. On August 29, 2009, the song re-entered the top 40 after a performance of the song on the British hit TV show X Factor by Joe McElderry. The song entered the UK Singles Chart on December 20, 2009 at number 48. While Vandross was hospitalized, a music video was shot for the single. Hosting famous friends of his and fans alike, the clip features musicians, singers, actors and sport stars. The video features childhood snapshots of Vandross. One of the singers who made appearance on the video is Beyoncé, alongside her father, Mathew. Knowles had collaborated with Vandross in the remake of the 1978 song "The Closer I Get To You", which also appears on Dance With My Father album. Other celebrities who made cameos are Monica, Brian McKnight, Johnny Gill, Stevie Wonder, Garcelle Beauvais, Damon Wayans, Holly Robinson Peete, Whitney Houston, Babyface, Morris Chestnut, Ashanti, Nona Gaye, Patti LaBelle, Ruben Studdard, Brandy, Quincy Jones and Wyclef Jean. Singer Celine Dion recorded a cover version of "Dance with My Father" which appeared on the So Amazing: An All-Star Tribute to Luther Vandross album. "Dance with My Father" has been released in various cover versions, and has appeared in many albums. Released in 2004, country music singer Kellie Coffey recorded a cover version of the song which peaked at number 41 on the Billboard Hot Country Singles & Tracks (now Hot Country Songs) charts. It was included on her unreleased second studio album, A Little More Me. Lyn Paul recorded the song for inclusion on her 2006 album Late Night. The song has appeared on various tribute albums to Vandross. For one, Dion, who also lost a father early in 2003, covered the song for the So Amazing: An All-Star Tribute to Luther Vandross album, which was compiled shortly after Vandross' death. Two years later, it was included on her greatest hits album My Love: Ultimate Essential Collection. In 2009, The X Factor winner Joe McElderry covered this song in his audition on the sixth series of the show. In the final, he sang the song again and was crowned winner. He sang the song at various gigs and eventually recorded the song in 2011 for his second studio album, Classic. This version premiered on Magic Radio on August 7, 2011. A stripped live performance was used as the music video for McElderry's version. The video premiered on Entertainment Focus on September 13, 2011. Filipino R&B singer Jay R covered the song in 2010, and is featured as a bonus track for his fifth studio album, Jay R Sings OPM Love Classics. Filipino singer Lyca Gairanod also did a song of Tagalog version of the song. In April 25, 2012, American Idol Season 11 contestant Jessica Sanchez performed the song during the show's Top 6 performance night. American Idol judges praised her for her performance. Jennifer Lopez, one of the judges of American Idol, said "That may have been the best I've ever heard that song sung." Sanchez told Ryan Seacrest, the host of the show, that she is dedicating her performance to her father who will be deployed to Singapore as a soldier. In 2013, Australian artist Anthony Callea recorded a version for his album Thirty. ↑ Waldron, Clarence. "Luther Vandross". Jet. Johnson Publishing Company. 105: 63. ISSN 0021-5996. Retrieved 2011-11-30. ↑ Billboard staffers (2004-02-21). "Billboard Goes to the Grammys". Billboard. Nielsen Business Media, Inc. 116: 69. ISSN 0006-2510. Retrieved 2011-11-29. 1 2 Flick, Larry (2003-09-04). "Dancing with Luther". The Advocate. Here Publishing: 59. ISSN 0001-8996. Retrieved 2011-11-30. ↑ "Luther Vandross". Ebony. Johnson Publishing Company. 59: 79. November 2003. ISSN 0012-9011. Retrieved 2011-11-29. ↑ Walters, Barry (2003-06-03). "Luther Vandross: Dance with My Father". Rolling Stone. Jann S. Wenner. Retrieved 2011-11-30. ↑ Jeffries, David. "Dance with My Father: Luther Vandross". Allmusic. Rovi Corporation. Retrieved 2011-11-30. 1 2 Kaufman, Gil (2003-06-11). "Luther Vandross Moved Out Of Intensive Care". MTV News. Retrieved 2011-12-01. ↑ "US singer-songwriter Richard Marx to hold concert at Big Dome". The Manila Bulletin. 2011-11-18. Retrieved 2011-12-01. 1 2 Moss, Corey (2005-07-01). "R&B Singer Luther Vandross Dead At 54". MTV News. Retrieved 2011-12-01. 1 2 "Vandross Video Features Famous Friends, Fans". Billboard. Retrieved 2012-01-02. ↑ "For The Record: Quick News On Kid Rock, Jimmy Jam And Terry Lewis, Consequence, Damien Rice, Pennywise, Our Lady Peace & More". MTV News. 2005-06-17. Retrieved 2011-12-01. ↑ "Dance with My Father: Celine Dion". Allmusic. Rovi Corporation. Retrieved 2011-12-01. ↑ World Exclusive: Watch Joe McElderry's New Video Entertainment Focus. Retrieved on 13 September 2011. 1 2 3 Billboard chart info AllMusic.com. Retrieved 28 July 2009. ↑ UK Singles Chart info Chartstats.com. Retrieved 28 July 2009. ↑ "Leona Lewis dank "Supertalent" wieder in den Download-Charts". Media Control. 2010-10-07. Retrieved 2011-11-29. ↑ austrianncharts.com. Dance with My Father. Retrieved in 2010-10-06. ↑ swisscharts.com. Dance with My Father. Retrieved in 2010-10-06. "Since I Lost My Baby"
"'Til My Baby Comes Home"
"I Really Didn't Mean It"
"She Won't Talk to Me"
"Don't Want to Be a Fool"
"Little Miracles (Happen Every Day)"
"Love the One You're With" / "Going in Circles"
"I Can Make It Better"
Itaal Shur & Rob Thomas - "Smooth"
Adam Clayton, David Evans, Laurence Mullen & Paul Hewson - "Beautiful Day"
Jesse Harris - "Don't Know Why"
Richard Marx & Luther Vandross - "Dance with My Father"
Adam Clayton, David Evans, Laurence Mullen & Paul Hewson - "Sometimes You Can't Make It on Your Own"
Emily Burns Erwin, Martha Maguire, Natalie Maines Pasdar & Dan Wilson - "Not Ready to Make Nice"
Guy Berryman, Jonathan Buckland, William Champion & Christopher Martin - "Viva la Vida"